Flying through the air at over 1800 miles per hour, a .30 caliber bullet collides with a light bulb. The shock waves from the impact move even faster than the bullet, cracking the glass on the far side of the bulb before the bullet exits. The bullet breaks free in a cloud of glass fragments and continues on its way. These photos represent an elapsed time of about 3/10,000th of a second, with each individual exposure lasting about 1/1,000,000th of a second. 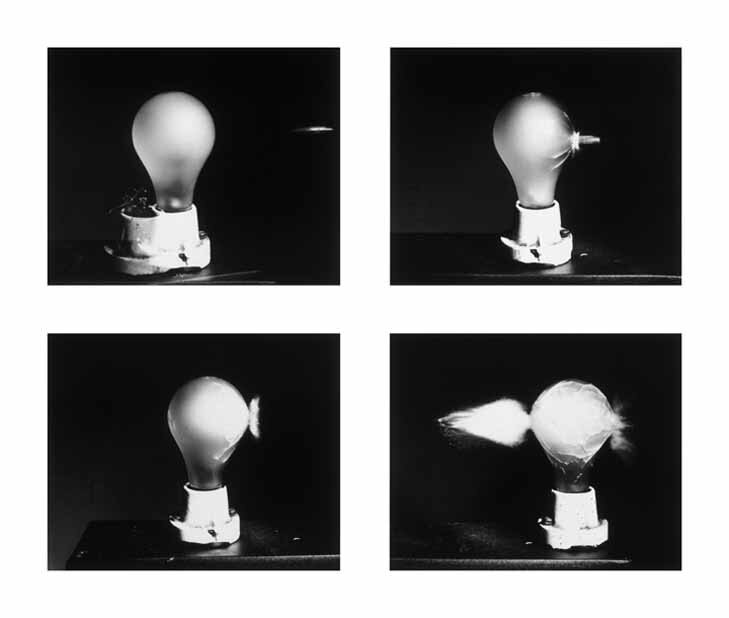 Though the series appears to be of a single bullet smashing a single light bulb, it is actually a composite of four separate bullets and bulbs. Edgerton used this technique often when photographing repeatable phenomena, in order to portray the event as accurately and with as much detail as possible.